One of the best travel books of the year has to be Like a Tramp, Like A Pilgrim: On Foot, Across Europe to Rome by former Coldstream Guards officer, and Blandford Forum’s premier travel writer, Harry Bucknall. Recounting his pilgrimage from Canterbury to Rome, it is fresh, and full of good humour. 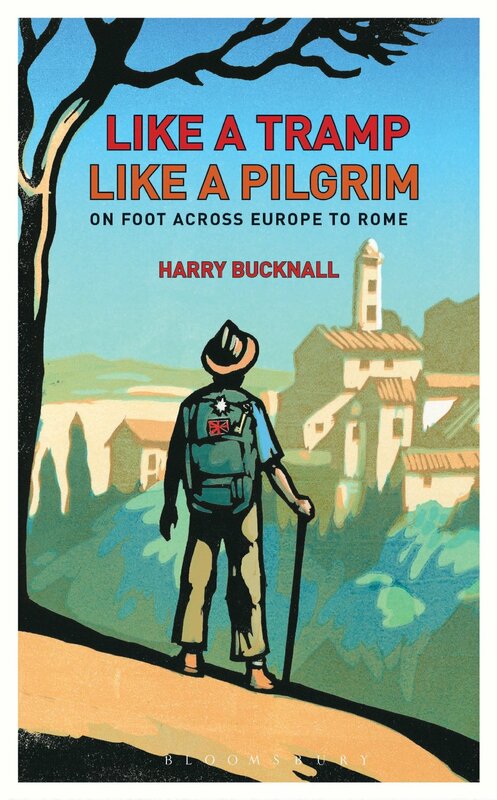 Like a Tramp, Like A Pilgrim: On Foot, Across Europe to Rome demonstrates Harry’s development as a writer since his Greek Odyssey. As a Santiago peregrino myself I instantly empathised with the motivations, the pains, the joys, and the surprises to be found on the solo journey of a pilgrim. Even when walking with others there is a solitary dimension to pilgrimage which permits the walker to observe with a detached eye the changing landscapes, the historical dimensions of the road, and the sometimes absurd characters one meets on the way: Harry very successfully brings us a gently unfolding list of observations, anecdotes and stories of friendship. The 1,500 mile route from Canterbury to Rome is an ancient and well travelled path. Our Anglo-Saxon chronicler Bede often sent his acolytes off to borrow books from the Vatican library but never made the journey himself. One has to ask if they managed to return them in time and how big the fines may have been. It is a long journey and one much less well-known than other pilgrim routes such as the one to Santiago de Compostela. Only a handful of pilgrims start out each day, compared to sometimes hundreds in Spain. This makes Harry’s journey all the more interesting for his readers as he encounters things new, and brings a wryly observed perspective to others more familiar. For me the second half of the journey was the most enjoyable. As Harry enters Italy the pace and temperament changes. Less history. More humour. Rather like Nick Hunt and Paddy entering Slovakia there is some invisible border on such a journey. One of the mind or the spirit. It may be related to something physical but it is more than this. From my own experience on the Camino it is clear that a long journey has many phases each with their own character. It is in Italy that Harry finds hilarious situations despite his tiredness. He reveals to us, and calmly copes with, the frustrations encountered in a country that does not function particularly well, whilst journeying with an ever growing band of assorted and garrulous pilgrims from many nations. As with all good travel books the tale ends with the enticing possibility of a further journey: a next phase. I look forward to that, but in the meantime I will recall with pleasure this enjoyable book. One for the Christmas list to help stave off (or possibly encourage?) wanderlust. It is potentially dangerous contraband. This entry was posted in After the Woods and the Water, My Albergue is Cold, Uncategorized and tagged Harry Bucknall, Nick Hunt on November 27, 2014 by proverbs6to10. Yes!!! the first thing I thought – where did that title come from? Lovely artwork for the cover.